Basically, every labyrinth that I make, is “my own design”. The pattern of the classical labyrinth is always the same, but in the process of making / drawing / building one, there are always choices to be made about location, orientation, size, etcetera. And during the process I keep the intention of the labyrinth in my mind. In that sense, every labyrinth I make is unique. But that also applies to anyone making a labyrinth with care and focus. 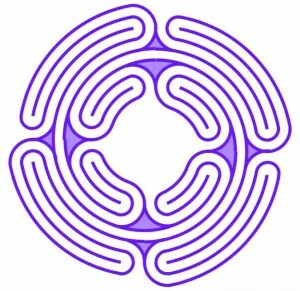 the Four Winds labyrinth with four interlocked paths. 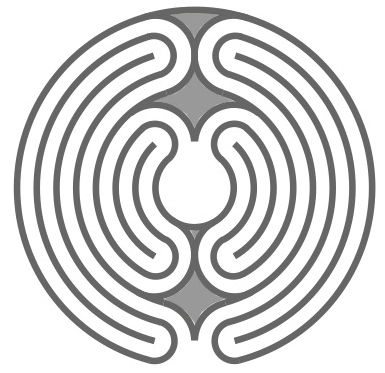 The You-and-Me labyrinth consists of two, slightly “unfolded” mirrored classical labyrinths that have been joined at their “bottom”. 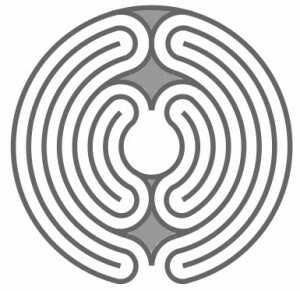 It is a round form that you may enter together with someone else, walking each your own, separate path and meeting in a common centre. Walking this labyrinth together with someone else illustrates and gives a feeling about your relation with the other person. Are you concentrating on your own path and pace, or are you attuning to the other’s pace? Do you consciously meet where the two paths touch each other and in the common centre? Do you switch paths or do you return the way you came? There are no good or false choices, but there is significance in the choice. This labyrinth has also some minor variations that I will not expand on here. 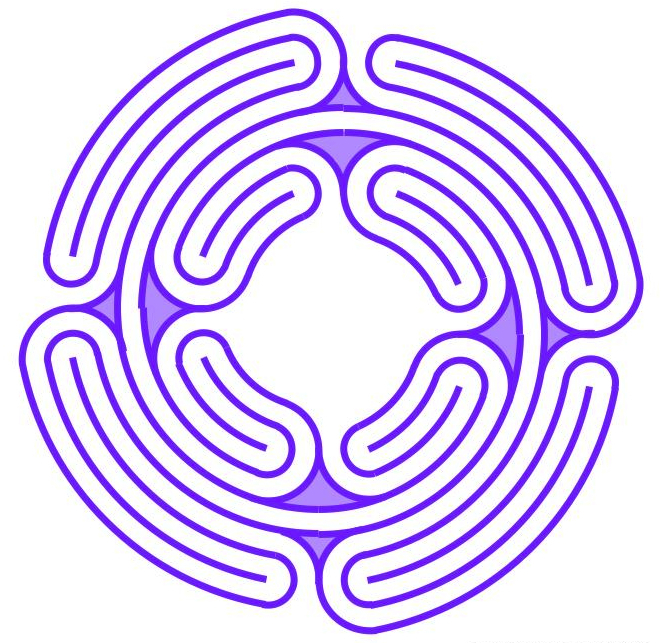 The Four Winds labyrinth appeared when I tried to combine four classical labyrinth patterns. Walking this labyrinth together is, again, a remarkable experience: you walk with three others that you approach or walk away from, while still being in the same space. You may even walk side by side with one other in your fourth circuit. How do you experience and express those relations? Are they mutual? Did you make a conscious choice which quarter you wanted to enter from, and why? What happens in the centre? It takes some time and lots of concentration to build this one (more than an hour on the beach), but I hold fond memories of the occasions I built one and of the people who joined me. In 2012 I made this labyrinth on the beach for my birthday, and we walked it with all the guests present. It was fascinating that the company “interlocked” in the centre, and tended to stay there although lunch was about to be served outside in a beach tent. When we finally exited, the conversations continued on the way out and during lunch. It was a true celebration to me. You may find two pictures of the event in the photo gallery.